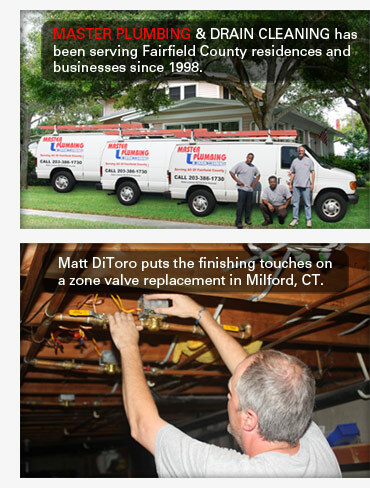 Since 1998 we've been providing quality plumbing, heating and drain cleaning repair and service to Fairfield County and New Haven County, Connecticut homeowners and business owners. We also provide plumbing contractor services from A-Z. We are family owned & operated, A-Rated by the BBB, fully insured and we NEVER inflate our pricing. We work with reliable, name brands such as Kohler, Delta, American Standard and Grohe. Our expert plumbers are available seven days a week by appointment. Emergency services are also available. Need service or have a question? Why not pick up the phone and give us a call? We'd sincerely appreciate an opportunity to serve you. Phone 203 386-1730, or if after normal business hours and you'd like to put a service request in, CLICK HERE to reach our service request form. If you'd simply like to leave a message or ask a question, CLICK HERE to reach our contact form. Thank you. **terms of guarantee are available upon request.